"Great news! Your service listing "Guaranteed Results: Anti-aging, Corrective Makeup Artist" is ranked #1 among cosmetic surgeons in Atlanta." Need solutions? Need answers? Barbara Pinson is Your Favourite Fairy Godmother! Pinson Cosmetic's techniques and products will help you conceal skin imperfections on your face and body. Plus, help you achieve a very natural look with the use of quality corrective cosmetics, and through teaching you the secrets of applying them yourself. "Our Purpose is to serve with kindness and Compassion"
What are Corrective Cosmetics? Corrective cosmetics can enhance the looks of everyone, through the techniques, and application of pharmaceutical grade products. Corrective cosmetics differ from over the counter cosmetics, in that they physically block the light from reflecting the discoloration of the problem area. Whether is it to conceal a scar, acne, birthmarks, a birth defect, vitiligo, rosacea, post surgical discoloration, under eye circles, spider veins, melasma, uneven skin tone, or tattoos, w e can personally help you conceal skin imperfections on both the face and the body.. You will achieve a natural look with the use of corrective products and we will teach you how to apply them yourself for a natural appearance. Is it a surgical procedure? Barbara Pinson is a medical makeup specialist, referred by physicians who understand that Pinson Corrective Cosmetics can enhance the work they have already done with their patients. Our services are ideal for concealing imperfections associated with routine surgical procedures such as: removal of skin cancers, tumors, cysts and laser surgeries or craniofacial procedures. So whether your correction is large or small, connect with Pinson Cosmetics and corrective specialist Barbara Pinson, to be your best self. We are an advocate for AboutFace USA, providing educational programs within the craniofacial community. What is involved? Is there a big time commitment? The first step is a private consultation. We can consult by telephone or in the office. We take as long as you need to answer your questions, customize a program for your enhancement, and then teach you the application steps properly, so you are confident and a happy client. Most appointments are between an hour and an hour and a half in length. We have skin care, color cosmetics, accessories and wigs for your convenience and privacy. Once you are a client, you may come in for refresher consultations, as a courtesy at no charge. Since I’ve been using Arbonne, someone asked my husband if I had a face lift. He said, “No, she is just high maintenance.” I really enjoy using the make-up. It makes me feel good about myself. Barbara is irreplaceable! She puts it altogether. My name is Myrna Vincente. 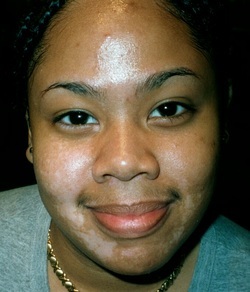 I have vitiligo. I have tried make-up over and over-nothing has worked. Then I came in to see Barbara Pinson and a miracle happened. She was able to cover every spot on my arms. I got so emotional over the difference it made; I will be a customer for- ever. Thank you. I am amazed at the difference in how I look! Barbara Pinson has an absolute gift in being able to do the makeover and teach me how to do it myself at home! She even numbered the boxes for me to follow! This was really important to me because I have to do this right... My daughter’s getting married in two days! Thank you for a great teacher! Barbara’s patience and teaching ability are amazing. I call her my favorite fairy godmother.